Pros: Good stuff is in the book's Chapters on cylinder heads, valve train and fuel systems. Cons: This book has several short comings. The Third Generation, Chevrolet Small-Block V8 was introduced as the LS1 in the 1997 Corvette. A slightly different version came in the 1998 Camaro Z28. Light-truck versions arrived in 1999 and 2000 and, in late 2000, a special high-performance variant, LS6, appeared in 2001 Corvette Z06es. Since the late-'90s, Gen 3 hot rodders have wanted a book on modifying those engines. 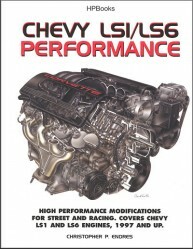 Chevy LS1/LS6 Performance, by Christopher P. Endres and published by Berkley's HPBooks division, is the first attempt at meeting that need. Reading its Table of Contents, one of this book's strong points appears to be its wide range of subjects, from simple bolt-ons to advanced topics, like valve train dynamics and cylinder head porting. Other attractive features are page designs which are clean and easy on the eyes and high-quality photos and drawings. The book scores points with appendices covering dyno-tested engine combinations, Gen 3 specifications and engine fastener torque specifications. The last two are especially valuable to DIYs because the only other place that information exists is in factory Service Manuals costing upwards of $100 each. Unfortunately, this book ends-up being just marginally successful as a how-to title on the Gen 3 engine family. It falls short of excellence for three reasons. 1) The book fails to deliver on its Table of Contents in some areas. Part of Chapter One is a history of the LS1 and LS6 engines which contains inaccuracies and omissions. Additionally, the Author wastes space opining that Chevrolet failed to produce his idea of proper 35th Anniversary, 2002 Camaros and 50th Anniversary, 2003 Corvettes. While those views may have merit; they don't belong in a technical reference about engines. Bolt-on enhancements are the most popular choice amongst DIYs looking for better performance from Gen 3s. Sadly, this book's coverage of bolt-ons is brief. Performance predictions about the few discussed in detail are, generally, not supported by credible test data. There is virtually no coverage of the legality of bolt-ons, other than a short statement: "The majority of cat-back systems are emissions legal." implying that most aftermarket exhausts beginning behind the catalytic converters are legal but some are not. Fact is, all are emissions legal because, currently, exhaust systems behind the converters (or behind the rear oxygen sensors on OBD 2 engines) are not considered emissions control devices. 2) The book has technical errors, contradictions and omissions. Here's a sampling: In a discussion of superchargers, the Magnuson Supercharger is incorrectly termed a "screw-type" supercharger. The Magnuson is a Roots-type, not a screw-type. The book's explanation of how a screw blower works is correct, but not when used to describe a Roots. The book covers the intake manifold for the six-liter, light-truck/SUV version of the Gen 3. First, it states there is no performance advantage in using that part on an LS1. Later, it publishes data proving the six-liter manifold demonstrates "...substantial airflow gain..." over the stock LS1 intake at every valve lift tested. There is no discussion of the implication of this seeming contradiction. Any conclusions are, apparently, left to the reader. In a discussion of aftermarket camshafts, the book claims mechanical roller cams generate significantly higher valve train velocities than do hydraulic roller cams. That blanket statement is not accurate. The book states that hydraulic lifters are incapable of proper operation above 6000 rpm. In other places, it claims hydraulic lifters can be used in engines running above 6000 rpm. Further, the LS6's and the LT5's rev limits are 6600 and 7000 rpm respectively. Both use hydraulic lifters. The book claims the "TECH 2" scan tester, used by GM dealers, is not available to the public. The TECH 2 is manufactured by the Vetronix Corporation of Santa Barbara, California and is sold by both Vetronix and SPX/Kent-Moore to anyone in North America who wants to purchase one. Finally, the book lacks an index. These samples are demonstrative but not the limit of the book's unfortunate problems. 3) The book contains material previously published by but not credited to, magazines, the Internet and the Society of Automotive Engineers Paper series. Admittedly, where it appears, this "borrowed" content does not affect accuracy. In fact, considering errors elsewhere; it may enhance it. I asked the book's publisher about this and a spokesperson for HPBooks replied, "We are confident that these brief quotations and paraphrasings fall within what copyright law calls Ôfair use.'" In this reviewer's opinion, that parts of the book were borrowed from other sources without them being properly quoted or credited, portrays neither the Author nor his Publisher in a positive light and raises questions about the possibility of misuse of additional but as-yet unidentified, previously-published material elsewhere in the book. As Chevy LS1/LS6 Performance was Mr. Endres' first book, he may not have understood proper journalistic practice as to use of copyrighted material created by others. Ok so much for the bad news. Good stuff is in the book's Chapters on cylinder heads, valve train and fuel systems. Is Chevy LS1/LS6 Performance worth $18.95? That depends on what buyers expect. Some of what's in this book was already available for free on the Internet. If you don't like Googling around with a PC and you need data about Gen 3 block prep, cylinder head modification or injector selection; what's there will meet your needs. Want the straight story on LS1's development history, bolt-ons, camshafts or tuning? That's there, too, but know that some of it is limited by a lack of depth, errors, omissions and contradictions. Right now, Chevy LS1/LS6 Performance is your only choice in Gen 3 books, so if you're intent upon its purchase; know it's a mixed bag. Next summer, it will be joined by other, similar books from other publishers. Once those go on sale, unless this book is revised; it will not be as good a choice.